Gambit was born without a name in a hospital in the lower wards of New Orleans. His parents abandoned him to the state the moment he first opened his eyes, showing from birth that he was different. He would have been shipped off to an orphanage and forgotten about had the Thieves Guild not intervened. He was believed to be “Le Diable Blanc” (The White Devil), the one prophesied to unite the Thieves Guild and Assassins’ Guild, putting the end to a long standing war between the two. The Guild put Remy in the charge of Fagan’s Mob, a group of street thugs who were known to use children as pickpockets and thieves after politics within the guild threatened to have the child killed. Fagan’s Mob taught Remy how to be a good and effective street thief. While under the tutelage of Fagan’s Mob, Remy was for all intents and purposes an orphan looking out for himself. Remy’s life changed drastically when he was around 10 years old. One night he tried to pickpocket the patriarch of the Thieves Guild, Jean-Luc LeBeau. LeBeau, recognizing instantly who the young boy was, took him under his wing, adopting him into the family. As a LeBeau, Remy learned even better how to hone his abilities as a thief. Shortly after hitting puberty, Gambit’s bio-kinetic charging powers began to manifest themselves. He kept this a close secret, not even letting his friends or family know. He would practice his control by himself late at night, far from the others to avoid being discovered. Before he was even a man, Gambit was told he would wed Bella Donna Bourdreaux. Bella Donna was the granddaughter of the head of the Assassins’ Guild. Remy didn’t object. He had known the beautiful Bella Donna since they were both 8 years old, and had often had a flirtatious relationship. Bella Donna’s brother Julien was not so pleased however. He challenged Remy to a duel at the wedding ceremony. Remy refused the challenge, but Julien pressed anyways. In an act of self defense, Remy killed Julien. The death of Julien at the hands of the adopted son of the head of the Thieves Guild put any hopes of a truce to bed. Remy was excommunicated from the guild and drove from New Orleans. Gambit wandered the world, making a name for himself as a master thief. During this time Remy made several contacts in the underworld, and even more enemies. Remy’s powers were growing the more he used them, and he feared that he would soon lose control. One of his connections referred him to a Dr. Nathaniel Essex, Mr. Sinister in disguise. Gambit went to see Sinister, who removed a small portion of his brain tissue to reduce Gambit’s power and in turn make them easier for Remy to control. 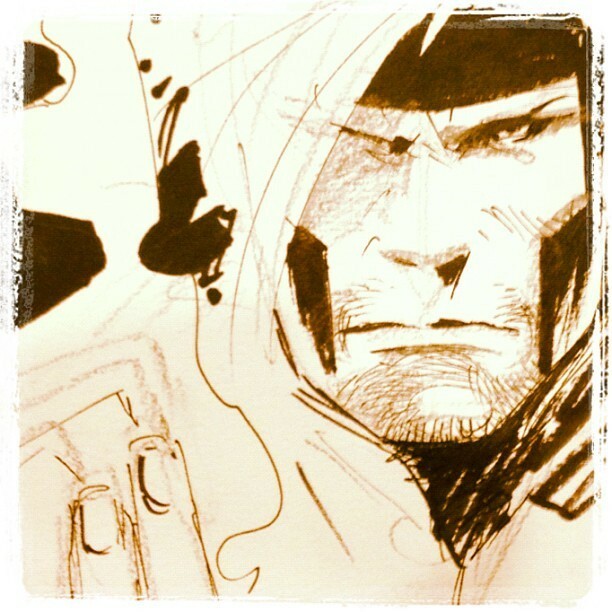 There was a price for the process that would haunt Gambit for the rest of his life. Gambit’s payment to Mr. Sinister would come in the form of Remy forming a team of mercs and assassins for a very particular job. Remy was oblivious to the fact that the team he was assembling would be used to harvest mutants by the dozens for Mr. Sinister’s vile genetic experimentation. When Gambit realized what the team he had assembled was up to he tried, unsuccessfully, to avert them. He himself was nearly killed by Sabretooth for his effort. He did manage to save a young mutant girl named Sarah, who would never forget the handsome stranger who rescued her. While still technically barred from the Thieve’s Guild, Remy would still do the odd job for the Guild under the table. There were those of course who knew who Remy was, but kept his secret safe, at least for the time being. The cajun set up shop in New York City, where he could lose himself in vast numbers of people living there. He now mostly works as a free agent, taking on jobs that interest him. Gambit possesses the mutant power to unlock potential kinetic energy in non-organic materials through physical contact. When he does this, the object overloads with kinetic energy and explodes violently. This unlocking is accompanied by a bright pink glow around the object being charged, and also from Gambit’s eyes. He has on one occasion actively been able to charge organic material, but it is highly unpredictable and something he vowed never to do again unless there were no alternative. The mass of the object he is charging will determine how long it will take to fully charge. A small object, like his trademark playing cards, is almost instantaneous. To fully charge a compact car would take up to a minute. He has never learned how large an object he could charge as the time it would take is prohibitive. Theoretically there is no limit to the size of an object that he could charge. The largest he has charged so far was a mid-sized sedan while an opponent was distracted. Likewise the strength of the blast is dependant on the mass of the object charged. A single playing card is the equivalent of a modern fragmentation grenade, or roughly 100 lbs. The resulting explosion from a small sized car would be close to 50,000 lbs. Remy’s ability to store and unlock kinetic energy also boost his agility and dexterity to near superhuman levels. This aspect of his powers is always in effect, and makes it easier for him to pull off the insane acrobatics he is so fond of. With this constant bonus, he has a vertical jump height of 3 feet, incredibly fast reflexes, and impressive hand eye coordination. This still puts him nowhere near the level of such fantastic acrobats as Nightcrawler or Spider-Man though. The charged potential energy that is constantly flowing through Gambit’s body also inadvertently grants him with a secondary power. One that shields his mind from the detection of telepaths. This interference has been described as a mild discomfort, like a headache, by the telepaths who have come across the cajun in the past and tried to detect him, or probe his mind. This shield does not, however, protect Gambit against telepathic attacks and invasion. What it will do it however is force the telepath to work a little harder to get past the first walls of defense of Remy’s psyche. Another strange side effect of Gambit’s mutation is being able to excite the kinetic energy within a person’s brain. This excitement of the energy patterns in a person’s brain can jump start certain chemical reactions that make the target more susceptible to subtle influence. This makes people much more inclined to believe what Gambit tells them, and more likely to agree with what he suggests. Gambit must be in close proximity to the person in question to succumb to the effects, and when they move away from Gambit, the effects slowly dissipate. More powerful minds like those of telepaths have shown to be immune to this power. Often Gambit is unaware that he even has this ability, he just thinks he’s a really charming guy. Gambit just has a way with the ladies. He seems to always know the right thing to say, when to say it, and just how to say it. There are few women alive who can resist the charms of the Cajun. They may not always give in, but most women walk away from an encounter with Remy LeBeau with their cheeks a little redder than they were before. Most times, Gambit uses his charms on women with whom he has no actual intent of forming a relationship with. Sometimes it’s more about the thrill of the hunt than the actual hunt itself. Remy is good and he knows it. Most of his personality traits stem from this one main trait. Even when he is up against a superior opponent or task that is above his usual ability, he will not admit defeat. (Though he might feign weakness to gain an advantage.) He can often be boastful of his prowess, but is careful not to claim proficiency in something that he is not. His confidence fuels his suave and debonair appearance as well, and overall boosts his performance both socially, and in combat situations. Just from the way the man carries himself, it’s clear that he is a proud individual. Life is a series of shows that Gambit puts on for the rest of the world to enjoy. Everything he does has a flair to it that makes people take notice, excepting the occasions where he doesn’t want to be noticed. Even then however, he’s often putting on a show for himself, just with a little less flourish. This natural predilection towards performing is in large part of how he can be so successful as a confidence man. Remy has always been able to make deep connections with others due to his empathy. These bonds often come with little effort on his part. Most people are inherently drawn to someone who seems to know just how they feel. He doesn’t always make it apparent to others that he feels their emotion, but deep down he cannot deny it to himself. This can also be a disadvantage for him as well, as he will occasionally take unnecessary risks to help others. Nothing is planned with Remy. Life itself is off the cuff with him. One can never be quite sure what he is going to do next. At any given time, he can be known to go find a fight to pick, or head off for some quiet secluded place where he can be alone with his thoughts. In the heat of battle, this makes it difficult for his opponents and allies alike to guess his next move. There are skeletons in this man’s closet that he would like nothing more than to stay there. He’s not proud of some of the things he’s done in his life. He often worries how others will judge him if they only knew the severity of some of his past actions. This also comes from his training as a thief, because no one wants to hire a man to do very bad things for them if they have to worry about him telling everyone in the bar about them later that night. This also applies to his loved ones, who are able to tell him their deepest darkest secrets without fear of Remy sharing their secrets. The people Gambit cares about are constantly under his watchful gaze. To be loved by Gambit is to know that he always has your back. He will go to the ends of the earth and back to protect those he deems worthy. This protective nature can also be blessed on people he doesn’t even know, as demonstrated by his attempted protection of the mutants being hunted by the Marauders. Gambit could talk a squirrel out of all of its nuts 3 days before the first large snow of the winter. He’s a smooth talker, and it goes just beyond an ability. For Remy, it’s simply a way of life. He’s fought adversity all his life, and learned early on that a silver tongue got him far. This is not to say his charisma is all smoke and mirrors. He is genuinely a likeable guy. Remy LeBeau is a very wanted man. For the most part, he has managed to avoid confrontations with the police over his more criminal activities. Bella Donna and the Assassins Guild want nothing more than Gambit dead for killing her brother Julien. An open bounty has been on Gambit’s head since the day he killed Julien. An Assassins Guild operative could show up at anytime and anyplace trying to make a name (and a small fortune) for himself by being the one to take out the Cajun. From the moment Gambit was born, there was no doubt he was a mutant. His birth parents abandoned him before even giving him a name because they feared their own son. His unique eyes give him away instantly without any showing of power, and as such must always be on guard for those who hate and distrust mutants. Gambit’s abilities were once much stronger before he visited Dr. Nathaniel Essex who removed part of his brain stem to subdue his powers. It’s difficult to say just how much more volatile and powerful Remy would actually be had he not requested his own powers be crippled. Remy will push himself beyond his own limits to protect those he cares for. He will, without even thinking, give his all to save an innocent. At the slightest sign a loved one is in danger, he will charge head on into the action to save them. While this is often an admirable trait, it has gotten Gambit in more than one sticky situation in his life that could have been avoided had he not put himself on the line for another. Though deep down, Remy knows he shares the same ideals as the X-Men, there’s always this nagging voice in the back of his head that he could never belong with a group like them. He feels that with all he’s done in his life, that he’s not worthy of being included amongst their ranks. This is, of course, an echo of his entire life. His whole life he’s been on the run from one thing or another, and it is nothing for him to just pick up and leave without a moment’s notice. When will he run away next? 2017-01-21 Holy Molly Was that a Car?